2019 started off with a rather interesting tweet from Elon Musk. He was showing off the "Starship test flight rocket" from SpaceX. This thing evokes a strong bit of imagery that has been so deeply integrated into our culture through science fiction for so many years that it just feels... right. Just look at that thing! Well, as you can imagine, seeing that beautiful piece of work inspired me to yank out some retro science fiction and look at the old illustrations. There are so many examples that you could just swap the test rocket into and they'd seem nearly untouched. The issue I've chosen for today's Sci-Fi Sunday is one of these. When I scan one of these, I'm always curious what the public was thinking and seeing about space. NASA has a convenient website where you can go and see details on major events. In December of 1962, the public was hearing about how Mariner 2 had flown by Venus, which was a pretty huge deal considering this was the very first time we had "conducted a planetary encounter". Just picture that for a second. 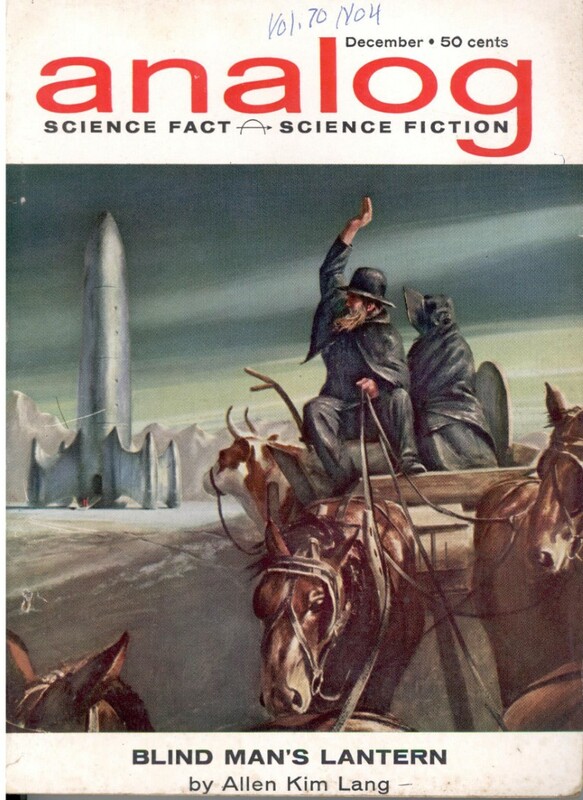 When someone was relaxing and reading this issue, we had not yet put a human on the moon. We had put humans in space, but they've only done orbits at this point, and on December 14th, one of our space robots passes by Venus and sends us back information. That had to be incredibly exciting. Aside from just checking on the general space news of the time, it is also intriguing to look at what the Apollo program was doing. I found a more detailed breakdown on what was happening within the Apollo program during November and December of 1962. NASA was deep in planning and testing, with the most interesting part I found being that they determined we should definitely have a bunch of cameras on board with the astronauts, and they hoped the government would supply those cameras. The government ultimately agreed. There's that beautiful rocket again. Obviously Musk's needs more portholes, but hey, they have time to iterate. In the middle of the issue there is a non-fiction piece entitled Intelligent Noise. It basically talks about some of the ways in which we secure radio communications using pseudo random noise generation. I'm not going to get into how that works, I'm here for the art and pictures! I've copied the captions to each picture as they were in the issue. I love this design for a space suit by Schoenherr. It doesn't seem to fit with the typical aesthetic of the time. Amy Goodman from Democracy Now interviewed linguist and political philosopher Noam Chomsky and asked him to explain Donald Trump; in a mere 10 minutes, Chomsky explains where Trump came from, what he says about the GOP, and what the best response to Russiagate is.